U.S. President Donald Trump has made a big fuss out of economic competition with China. He's even threatened a trade war! But today, he came out to bat for, uh, Chinese smartphone manufacturer ZTE, which has basically ceased to exist after the Department of Commerce slapped it with a seven-year ban on buying or using components from US companies over allegations it violated sanctions on Iran and North Korea. Apparently, all it takes is a plea from his Chinese counterpart Xi Jinping, and Trump will jump at the chance to protect those foreign jobs. "President Xi of China, and I, are working together to give massive Chinese phone company, ZTE, a way to get back into business, fast," Trump wrote. "Too many jobs in China lost. Commerce Department has been instructed to get it done!" Again, the reason that Shenzen-based ZTE was forced to suspend most of its operations in the first place was because the Trump administration accused it of violating the sanctions on North Korea and Iran — and at least in the latter case, Trump recently stepped said sanctions up significantly. ZTE also landed in this position because it allegedly continued to mislead authorities and failed to take corrective action after it had already been punished with a $2 billion fine. 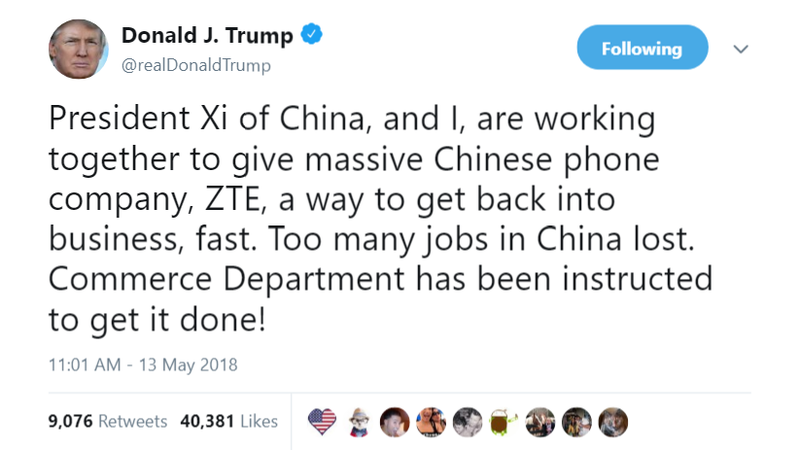 It was just earlier this month that Trump was tweeting about how China had become "very spoiled with US trade wins," and the ZTE penalties were potentially a huge negotiating point that could be played into upcoming talks. Finally, US intelligence agencies have been sceptical ZTE isn't using its tech to spy on people on behalf of the Chinese government. So this is a massive reversal of both official US policy and Trump's own talking points, seemingly at a whim and with no clear indication of whether the president got anything in return. About the best that could be said about this decision is that if you disagreed with the sanctions or Trump's trade strategy, at least he's undermining them. ZTE's lines of mostly low- to mid-end phones couldn't be properly assembled without US-made parts like Qualcomm chips and Corning glass, and the seven-year penalty also denied it key Android features like the Google Play store and developer pre-access to updates and security releases. The sanctions also kneecapped ZTE's ability to work with US carriers and expand its worldwide telecommunications infrastructure business. The combination of these factors forced it to shutter manufacturing plants, and ultimately threatened to force the company out of business permanently. As the fourth-largest smartphone company by US market share, ZTE's fate could impact a number of US firms tied to its supply chain or that are involved in distribution or sale of its products. According to CNET, it spent $US2.34 ($3) billion on US suppliers in 2017. For the Chinese, the pain was potentially much greater: The firm has tens of thousands of employees who could stand to lose their jobs. For example, he has said that he would impose tariffs on steel and aluminium imports, but he has temporarily exempted Canada, Mexico, the European Union and several other countries while leaving China and Japan searching for answers. His advisers have launched official or unofficial trade discussions with numerous countries, and these talks are wrapped in uncertainty because it is unclear whether Trump will follow through on promises to impose tariffs, even if they might raise prices for U.S. consumers. Trump has spoken of being friends with Xi, and has at times looked upon the latter leader's decision to make himself president-for-life with obvious admiration. It's also pretty clear that Trump, who is not known for his attention span and reportedly has to be walked through policy briefings like a child, doesn't always understand what he's talking about and is easily swayed by people who know how to play to the pomp and circumstance of his office. Maybe it will turn out he extracted some kind of concession, but it also seems possible Xi got the president to roll just by asking him for a favour. Who knows.